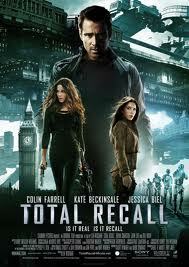 In this week’s “At the Movies” episode, Blake and Kenny take in the new remake of the sci-fi classic Total Recall. How does it stack up against the Schwarzenegger original? Is it worth seeing? In the picks, Blake surprises himself and everyone else by picking Avengers Vs. X-Men #9. Don’t forget to send in your top ten favorite time travel stories for our next top ten episode! Contact us with comments, suggestions, or anything else at Showcase@CXPulp.com! This entry was posted in At the Movies and tagged Avengers, Avengers Vs. X-Men, Bryan Cranston, Colin Farrel, Jason Aaron, Jessica Biel, Kate Beckinsale, Marvel Now!, Spider-Man, Total Recall, X-Men. Bookmark the permalink.